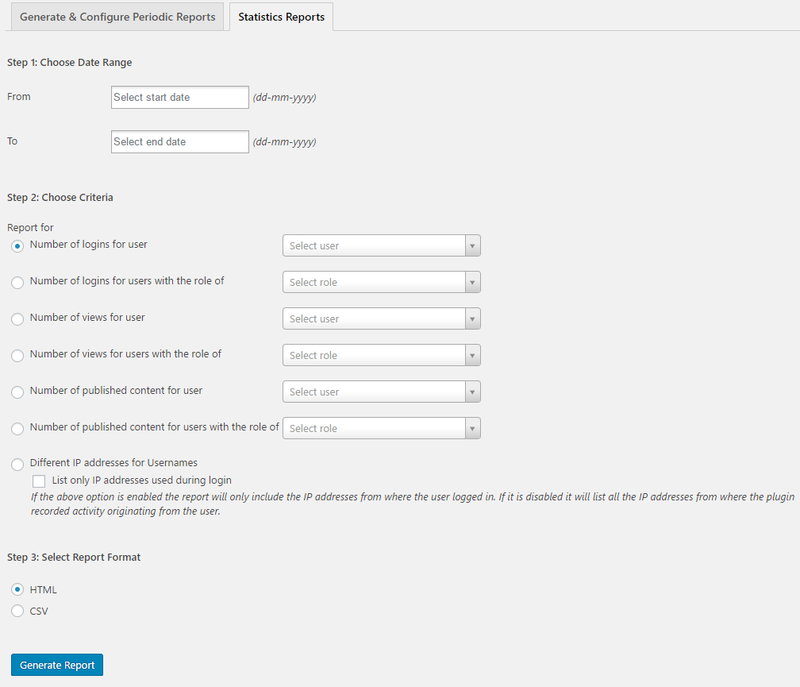 The WordPress reports can be used to generate any type of custom report from your WordPress audit trial and export it to an HTML or CSV file. You can also configure automatically generate daily, weekly, monthly and quarterly summary reports that are sent to you automatically via email. To generate a report navigate to the Reporting tab. You can generate any type of report, such as a report about the activity of a specific IP address, user or users, role or site in case of a multisite installation. 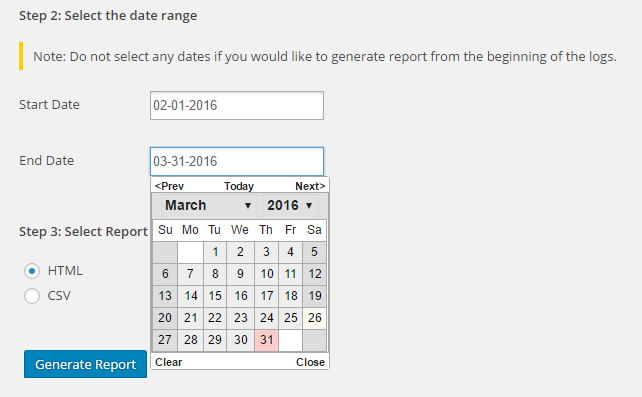 You can also specify a date range for the report. For this example we will create an HTML report to see the activity of the user Ruby on site1.wpauditlog.com for the months of February and March. In the By Site(s) option specify the site’s name, for this example site1.wpauditlog.com. In the By User(s) option specify the user for which you would like to create the report, for this example Ruby. For this example ignore By Role(s), By IP Address(es) and By Alert Code(s) since we would like to see all of the alerts generated by the user. If you would like to generate a report for a specific time frame specify the Start Date and End Date from the calendar drop down options. For our example we will specify the 1st of February 2016 as a start date and the 26th of March 2016 as an end date. You can export the report in both HTML and CSV format. In our case we are creating an HTML report, hence select the option HTML. Once ready click the Generate Report button. The report will be automatically created and downloaded to your computer. Below is a preview of the report. You can configure the Reports add-on to automatically send you any type of WordPress report on a daily, weekly, monthly or quarterly basis. To configure automated email reports simply configure the criteria as explained in the above section, and instead of clicking Generate Report Now, scroll further down to specify the email or email addresses and the Report name. Once ready select the schedule by clicking on Daily, Weekly, Monthly or Quarterly. All the configured periodic WordPress reports are shown in the Configured Periodic Reports table at the bottom of the Reports Add-On admin pages, as shown in the below screenshot. Click the Send Now button to instantly generate and send the report and click Modify to modify the saved report. Once you are ready with the modifications click the schedule interval button again (daily, weekly, monthly or quarterly) and the report will be updated. Note: You can use the List of IP Addresses used by user report to see if for example a paid membership is being shared. To generate any type of statistics report click the Statistics Reports tab at the top of the Reports admin pages. Below is a screenshot of the Statistics Reports options. 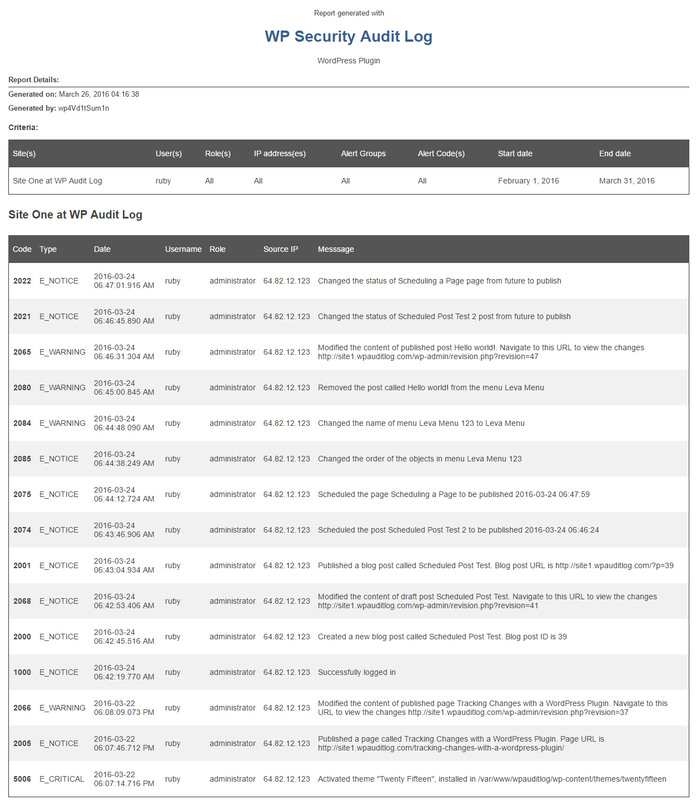 If you need support with the WP Security Audit Log plugin please do not hesitate to get in touch.